This Holiday season why not take some time out and treat yourself and a loved one to dinner and a movie? 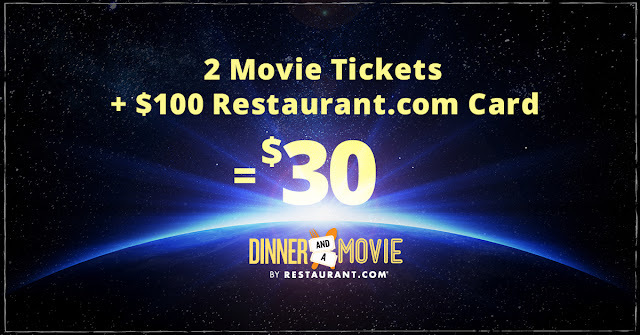 Right now, Restaurant.com is offering 2 movie tickets + a $100 Restaurant.com gift card for only $30! That is such an amazing deal especially since going to the movies is so expensive now. After all the madness winds down, enjoy some quiet alone time with your significant other at a fraction of the cost because after the holidays who really has that extra money? This awesome deal is running from December 14,2015 - December 20,2015 (while supplies last) so make sure you head over to Restaurant.com to snag this deal before it sells out.